Today’s buzzword is “digital marketing.” Gone are the days (for many companies anyway) of investing in SEO (Search Engine Optimization) and reaping the rewards. Instead, it is typically necessary to engage in various forms of digital marketing in order to see the best results and get a Return on Investment (ROI). This is the first in a series of posts that discuss the various aspects of digital marketing and where you should prioritize. Whether you are doing the work yourself or hiring a digital marketing company, it is imperative to be able to measure results. The easiest way to do this is to set up Google Analytics and define goals (or conversions, as they call it in the industry). For most of us, a goal is not a sale but it might be a lead – e.g. someone that completes a form on your website, or someone that clicks on your email address (or phone number) while using a mobile device. You can (and I encourage you to) have multiple goals. They could be as simple as downloaded a PDF! Prospects find you in locations other than just search engines, hence the need to be visible where they are open to finding you! This typically means being visible in both search engines (where people “search”) and social media (where people might stumble across you). It is getting more difficult to be visible in the organic portion of Google (more on that to come in a future blog post) and the same with Facebook! As you negotiate your marketing budget moving forward, you will want to devote funds to increasing your visibility in Google and whichever social media platforms are right for your business. 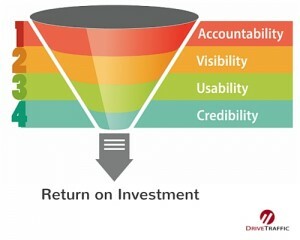 So long as you are being accountable and measuring your results in Google Analytics or other software, you should be able to change course and optimize your campaigns so as to ensure an ROI! Usability goes hand in hand with credibility – people buy from those that they “know, like and trust.” How can you establish credibility through usability? You definitely need to ensure your site is responsive (e.g. provides a good viewing experience on a mobile device) with quick loading, font size that’s legible, etc. Does the contact form work on your website? Can people easily scan your site or does it require intensive reading? Do you offer your website visitors the opportunity to search for what they want or do you force them to browse? (Did you know that approximately 20% of website visitors use your search box? And that you can track what they are searching for by using Google Analytics?). Remember that people buy from those that they “know, like and trust.” How can you establish credibility or help people get to know you and/or your company? Videos are a great way to display your personality (and they are also good for enhancing visibility in search engines and social media so win/win/win!). Social media is also important in establishing credibility and showing who you are. If people find you in Google, they will likely check you out on social media before even reaching out to you, never mind committing to do business with you! Even if you just share relevant articles (called curating rather than creating) on social media – it can provide visitors with a sense of who you are and what you stand for. Of course credibility can also be established (or broken) on your website by what you say, how you say it, typos, etc. Testimonials, too, are an excellent way to increase credibility in addition to the tactics mentioned earlier! Overwhelmed? Don’t be! Start at the top of this post – highlight all of the recommendations and ensure you have them in place. One foot in front of the other! Stay tuned for future posts that provide additional tactics you can try yourself before hiring a digital marketing company!